Starting a new thread on this, as I want to bring this to anyone's attention who has or will experience something similar. In a nutshell, about a month ago, my AWD in my 2008 stopped working. It happened to coincide with a massive rainstorm that happened non-stop for days. Interestingly enough, after the storm was done and things dried up the error went away but came and went from time to time. When it rained it always came back. I brought it to my mechanic who scanned the code and found it was a AWD relay. In looking at it, he found the relay in the back fuse box (rear left side, against the wall behind the carpeted cover). When he opened the cover, the whole area of the fusebox was corroded and the relay was as well. He replaced the relay and cleaned up the corrosion. He did say that obviously moisture got into there at some point but hard to say when and how long. Due to time I opted not to have him figure it out and I would do it myself. In looking online, there were reports of issues of the tailgate harness letting water in, so I basically sealed up anything I could on the side wall of the frame of the tailgate area with silicone. Looked ugly as can be but who cares - that whole area was one big silicone glob. Had my daughter jump into the trunk and I went to pour water on the side of that tailgate with it closed. No water got in. I assumed that the problem was fixed. This morning it is raining HARD again. I was like, "yeah well, who cares - my car is nice and dry now." I opened up the cover for the fusebox and to my surprise, there was water in there again. It is coming from the INSIDE of the carpeted wall and dripping onto the fusebox. I have no idea from where it is actually coming from on the outside. But based on the fact that the tailgate was closed all night and morning, no way it is leaking through anything on the tailgate side (which is all globbed with silicone anyway). But since it was raining hard and I didn't want that fusebox getting wet, I stuffed a bunch of hand towels in the space above the fusebox (see photo). I checked it later this afternoon and the towels were drenched. I can only imagine how much water got into the car when it rained before I discovered this (which makes me kind of thankful that that AWD error came up initially). Called my mechanic to make an appointment but in the meantime I talked with one of our vendor colleagues. He suggested I talk to another guy at work who has a 2010 MDX. So I went up to the other guy and asked him whether he has had leaking. To my surprise, he emphatically said YES. Not only did he have leaking, but it was leaking in the same area, and it was a lot worse than mine as he showed me videos of water coming into his car from the carpeted wall seam - at least it wasn't dripping on his fusebox as the water came in about 8" in front of where mine was, but his was pretty bad - it looks like a dripping faucet on the inside of his car. He said that he called Acura and they asked if he had a roof rack. He said yes, and they said it is leaking from there. How Acura knew this, I don't know...but my colleague decided to tackle the job himself, figured out how to remove the roof rack and then apply tons of silicone to it in order to stop the leak. He said it has stopped the leak completely since then. So on a coffee break this afternoon (a long one), we took my car out of the rain and parked it in one of the covered areas at work, and I pulled out the silicone tube and he went to work disassembling my roof rack (I offered to do it but no point having him explain it to me when he can just do it since he has more mechanical aptitude than I), globbing silicone on the 6 x bolt areas (3 pairs of 2) that held the rack in place - and then screwing everything back. I was pretty amazed that there is no rubber gasket or anything between the roof rack bolts and the roof rack. I can see how water would get into those holes. Hopefully the silicone did the trick. So now it is a waiting game. With the roof rack out of the equation, if it continues to leak, my next thing to look at it would be the rear fixed window. Hopefully that's not the case. But we'll see. If they fell out, the water could be splashing up and into that fuse box area. They are cheap from Acura, and a fairly easy install. Forgetting if unbolting the corners of the bumper were necessary or not, but did it anyways. Added some silicone sealant to seal them properly. This MAY be solved now. Brought it to my mechanic two days ago. He sprayed water all over the car. No leak. He stuck it back outside since it was set to pour in the afternoon. It did. He checked again. No water. When I showed up, he had everything but the wall taken apart and he said he cannot in good conscicence take apart the wall without seeing a leak since there's a ton of tabs and they break easily, not to mention it is significant work taking out the side airbags and all the associated trim areas that go with it. He suspects what happened is this: it was the roof rack and when my colleague and I took it apart to silicone, it was after hours of hard rain so whatever water was in there seeped into the car. After siliconing it, the water in the car continued to drip and that's what I felt the next morning, and assumed it wasn't fixed. But the fact that it sat in the rain on Wednesday and my mechanic also sprayed water all over it and they felt not one drop may lend credence to the fact that the silicone on the roof racks did the trick. It hasn't rained since so I can't really test it myself but it's better news now. It’s the plastic attatch points on the plastic flashing on the same side as fuse box. They aren’t sealed. With time the factory glue pad releases and you have 3 leak points that allow water into and on the foam in the cavity which drips directly on to your fuse box. Seal those or replace and that should fix your problem. Do you a picture you can show of this plastic? RainGoat and 07J36 like this. I've seen a lot of these 07-09 MDX issues with water leaking into the rear fusebox. Most of them have been the seams/welds on upper roof left corner area. Pin size holes water leaks into. You will need to pin point the location carefully with trial/error. Hi everyone. I am so glad owners continue to post even years after a thread has posted. My issue- several weeks ago I noticed water in the rear trunk storage compartment (2010 Acura MDX). I thought it was from two water filled thermos' I left there for later use. I emptied the thermos', cleaned and dried the area only to find more water in the trunk storage compartment a week later. That was twice the storage compartment was cleaned and dried, until this morning. This time I noticed the water entering from the passenger side panel just above the rear speaker. I thought and realized each time it had been raining like crazy. Thanks for this thread. My MDX does not have a roof rack. So I am not sure where I am going to start. I may look at the plastic flashing on the rear passenger side. I will post my findings later. I have an ACURA MDX 09 and just found this problem last week (that my fuse box shorted out. Last week I noticed that my door locks were not working, followed by my windshield wipers intermittent setting, and finally my turn signals would not work. 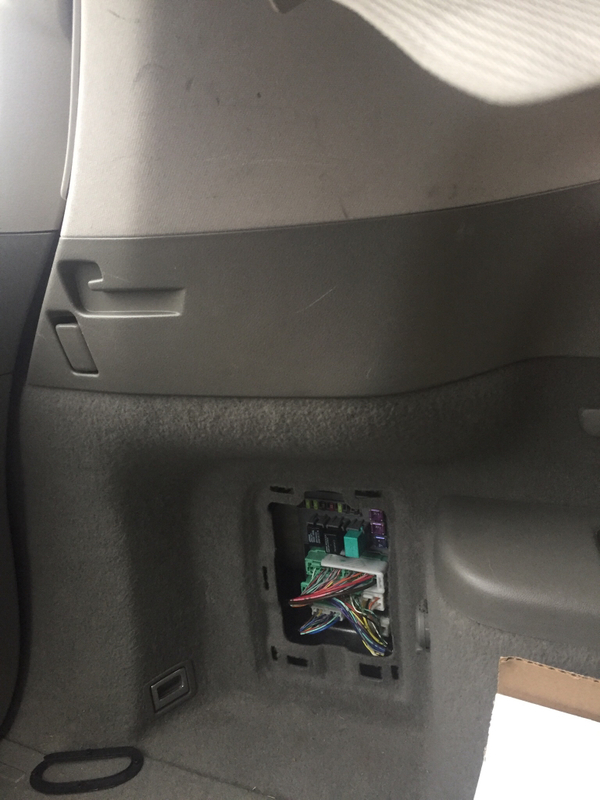 It was not confirmed from my mechanic that it was due to the dampness in the fuse box area., they thought the aftermarket add-ons (that were put on prior to my purchase) could possibly be shorting out the box. But after a few dry days, it worked again. So it was definitely due to water. I am getting ready for a trip (in a Nor'Easter) and am nervous so I did a search and found this. Thanks so much. I put a plastic bag over my fuse box and stuffed towels above it. Hopefully that will work for now. But am very annoyed by this problem. I do not have a roof rack, so I started exploring the outside of the car (standing in the rain.) It appears the seal to the back window on the left side is broken (the window by the third row seats). I pushed on it from the outside and the water squeezes out. So I am guessing that the seal is broken and the water is getting in there. Based on this thread, this is obviously a manufacturer problem that they know about. It is a shame that they can step up and fix it as a defect. I plan to give them a piece of my mind on Monday. But thanks for the direction everyone. One more thing... I just check it again. Towels wet after being parked in the rain for 1 hour. But I also noticed that the water could possibly be getting in via the bolts where the tail gate attaches to the body of the car. Will be checking this out on Monday. I will be in touch. For those without roofracks. Does the top of your vehicle have the capability for a roof rack? In other words are there predrilled bolt holes that are covered with some filler piece? If so worth checking it out. For all of you with 07-10 mdx rear fusebox water leak issues I know where its coming from. Pour water into roof trim channel towards the rear, where that water starts to drip off that channel and onto the top left hatch area, at that exact corner is where the water is coming in. Above the wire harness rubber boot. All that factory body seam need to be reseamed or resealed. Especially at that top channel/corner area. And your water leak is gone. stach and RainGoat like this.